I don’t normally review or promote products on this blog, but because I’ve really been blown away by Logos Bible Software I am willing to make an exception. The kind folks at Faithlife gave me a free upgrade to the new Logos 8 to review and after reviewing it for the last few weeks, I believe there are some features which could really transform your Bible study. Here are some of my thoughts on Logos Bible Software. Before I get specific about Logos, let me say a word about studying the Bible digitally versus studying from a paper Bible and other physical resources. I love physical Bibles. I have more physical Bibles than I care to count. Lately, I’ve especially been enjoying the ESV Scripture Journals. Each volume is both an individual book of the Bible and also a lined journal. They are absolutely amazing. Saves money. Digital Bibles and resources are so much less expensive. I can afford to have a much larger digital library than a physical library. Saves space. My Logos software contains almost 1,000 resources and I can take all of those resources with me on my laptop, my iPhone, and my iPad. That means I can carry my entire digital library in my pocket! Saves time. When I’m looking for a quote or nugget of wisdom, I don’t have the time to take 1,000 books off of the shelf and scan them all, but I do have time to type in a search filed and allow the software to instantly scan a 1,000 resources. Again, I’m not claiming digital resources are better than physical resources. I’m saying it’s a blessing to have access to both. Although I haven’t been able to use it much yet, I’m really excited about Logos’ new Canvas feature. It allows you to insert a passage of Scripture on to a digital canvas and then add shapes, lines, arrows, highlights, and other elements to emphasize words or even diagram sentences. You can move words around. You can add other information to the side. It seems there are countless creative things you could do with the Canvas feature. Basically, I think of it like having a whiteboard on which to write a passage and then having the ability to work with the passage in creative ways to help you understand it and even teach it to others. One of the features I use a lot is the Explorer tool. If I open the Explorer tool and search for a passage, it lists the biblical events, people, places, and things found in that passage. It also lists any media, content, or commentaries that I have in my library which reference that passage. Additionally, it cross-references Scripture associated with that passage. The Explorer tool allows me to find every resource in my library associated with that passage. It lets me dive deeper into any subject or person mentioned in that passage. Not only does this save time when studying a passage, but more importantly, it helps ensure you don’t miss any relevant information about that passage. Logos 8 is equipped with multiple “workflows,” which allow you to study through a passage, a subject, a word, or even write a sermon without missing any steps. My favorite workflow in Logos is the “inductive Bible study.” When I teach people how to study the Bible, I always encourage people to study the Bible inductively. There are three major steps to inductive Bible study: observation, interpretation, and application. The Logos Inductive Bible Study workflow walks you through those three steps (and all of the sub-steps) so that when you complete the workflow, you have an excellent understanding of the passage. We have all developed some bad Bible study habits. Maybe we have a tendency to read a passage and then make application to our lives without really understanding what the passage meant to the original audience. Tools like this help ensure we don’t skip steps like that. Logos is such a powerful piece of software that it can be pretty overwhelming. Thankfully, Logos has provided some excellent video tutorials on their YouTube channel. If you want to learn a feature, then just watch their video on that particular feature. Admittedly, Logos is not cheap. They have several different packages, but they are all fairly expensive. Thankfully, Logos is offering you a discount for being a reader of my blog. Just go to Logos.com/partner/radicallychristian and make sure to use the code RADICALLYCHRISTIAN8 when you check out. One thing you might also consider is purchasing Logos for an elder, Bible class teacher, or preacher you know. You could share the cost with several members of your congregation and give Logos as a Christmas gift. Most preachers I know would be absolutely thrilled to receive such a gift. 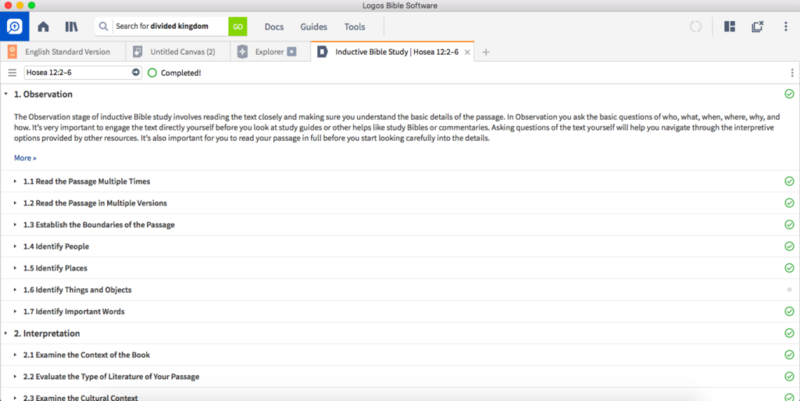 Whether you (or someone you know) want to learn about Greek, Hebrew, biblical archeology, biblical geography, or just have more resources at your fingertips and be a better Bible student, Logos is truly a great tool. Note: I only recommend products that I personally use and in which I believe. You certainly do not have to use the above links to find and purchase the products mentioned, but if you do, it will help to keep this blog going because the companies share a small royalty for every purchase made using those links.